Intaglio – comes from Italian and means to engrave or cut into. Goldsmiths and armorers used intaglio principles during the Middle Ages. With the arrival of paper in the 15th century intaglio printmaking was established as a specific art medium. It enabled craftsmen to keep a record of their designs and follow work in progress. It gave a predominantly illiterate population a means of communication through widely available images depicting saints and other religious themes as well as the production of books. Beforehand books were a luxury only available to the very wealthy. From this point intaglio developed a rich history including Durer (16th Century German), Rembrandt (17th Century Holland) Piranesi (18th Century Italian), Hogarth, Gillray, Rowlandson and Blake (18th Century England), Goya (18th Century Spain) through to 20th Century artists Beckmann, Kollwitz, Picasso, Klee, Matisse and Kandinsky. Print is a medium explored by most contemporary artists from all disciplines. Intaglio printing – Printing from the crevices and grooves engraved or etched into a metal plate. The image areas in intaglio are depressed below the surface of the plate unlike relief processes (i.e. woodcut) that rely on the raised areas bearing the image. 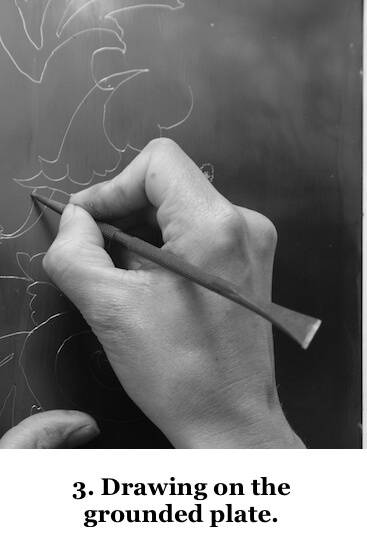 Engraving is where the artist draws directly onto the plate without using ground or acid. 2 Etching – (hard ground, soft ground, aquatint, sugarlift) The metal plate is covered with a protective ground, which is then drawn on with a variety of tools. Where the ground is removed by the tool a line is formed. The vehicle for cutting the line into the metal is an acid solution. The plate is covered with an acid resist coating (ground). The ground is hardened by smoking with a candle and left to cool. Once cooled the design can be drawn or scraped into the ground exposing the plate underneath. The plate is then submerged in an acid solution until the desired depth or width in the bitten area is reached. Once the plate has been completed the depressed areas are filled with ink and the non-printing parts wiped clean. 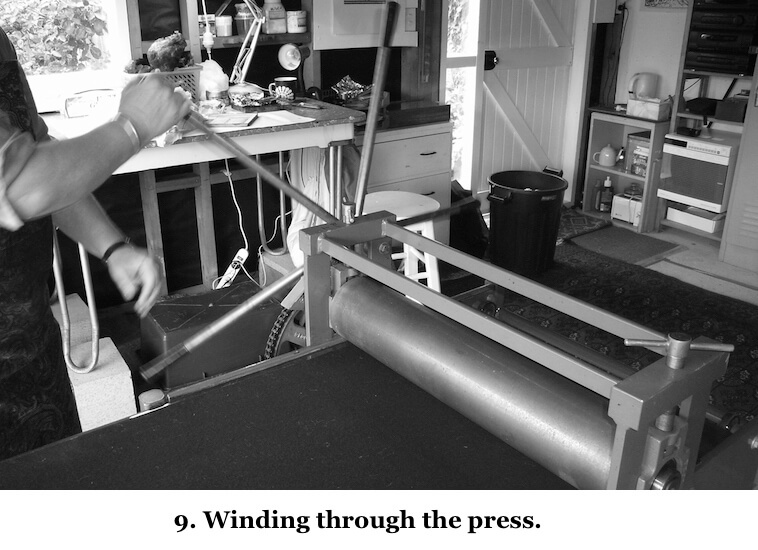 Dampened paper is placed on top of the plate and passed under considerable pressure through a printing press. The image is transferred from the plate onto the paper. Multiple images can be printed from one plate forming an edition. The prints are kept in their printed sequence between boards for drying. Once dry the prints are curated, numbered and signed by the artist. Each edition is limited with the last print being identical to the first. Once the quality of line changes the edition is closed and the plate defaced to prevent any further printing.